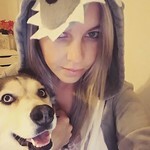 If you aren’t following me on social (WHY?! DO IT! 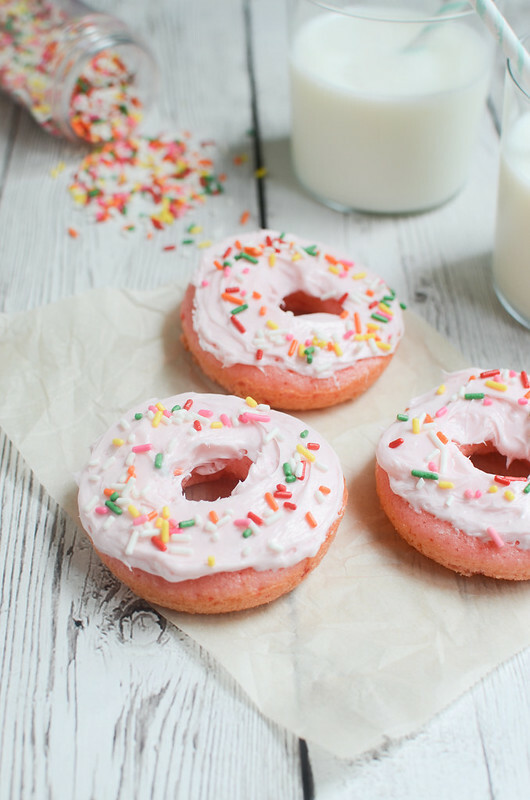 ), you may not know that I am beyond obsessed with doughnuts these days. I plan my weeks around when and where I can get doughnuts. I went hiking the other day just so I had an excuse to hit my favorite drive thru doughnut shop on the way home. As you read this, I’m probably somewhere buying our weekend supply of those fried rings of deliciousness. But I thought for right now, I could show you my favorite cheater way to make doughnuts at home. Yep, cake mix! 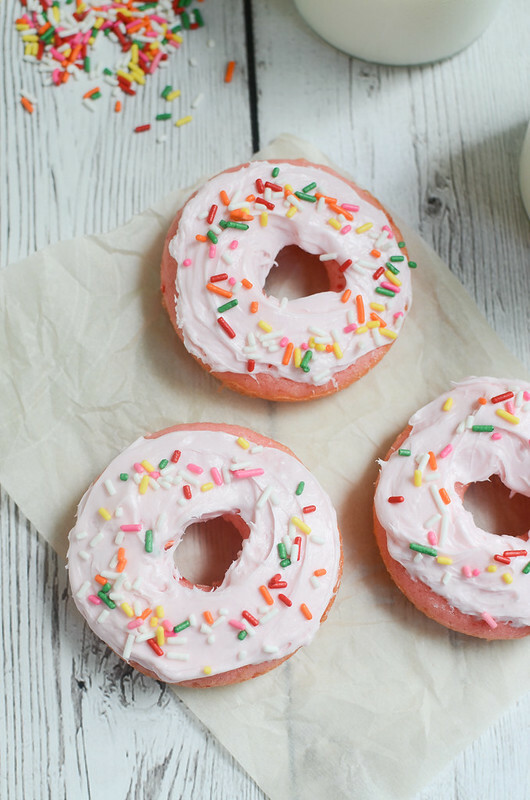 All you need is cake mix and a doughnut pan. Well, and all the other stuff but you probably already have oil and eggs and water. You know I love the Pillsbury Moist Supreme cake mixes! They are my all-time fave cake mixes – cakes and cupcakes just turn out so moist and fluffy! And doughnuts turn out moist and fluffy too! Woo! 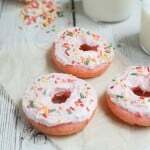 So to make these Strawberry Cake Mix Doughnuts, you just mix the cake mix with oil, eggs, and water and then bake them for about 10 minutes. Let them cool and then cover them in my new favorite frosting: Pillsbury Fluffy Frost in Strawberry Marshmallow. And then put sprinkles everywhere! If you’ve never had a baked doughnut, they’re really more the texture of a cupcake buuuuut, it’s more fun when they’re shaped like doughnuts, right? I love these and I hope you love them too. Let me know what your favorite ways to use Pillsbury cake mixes and frostings in the comments! In a mixing bowl, beat Pillsbury Moist Supreme Strawberry cake mix, water, oil, and eggs together until combined. Fill each section of the doughnut pan about 2/3 full. Bake for 10 minutes. Let cool 5 minutes in pan and then flip onto a wire rack to cool completely. Repeat with remaining batter. 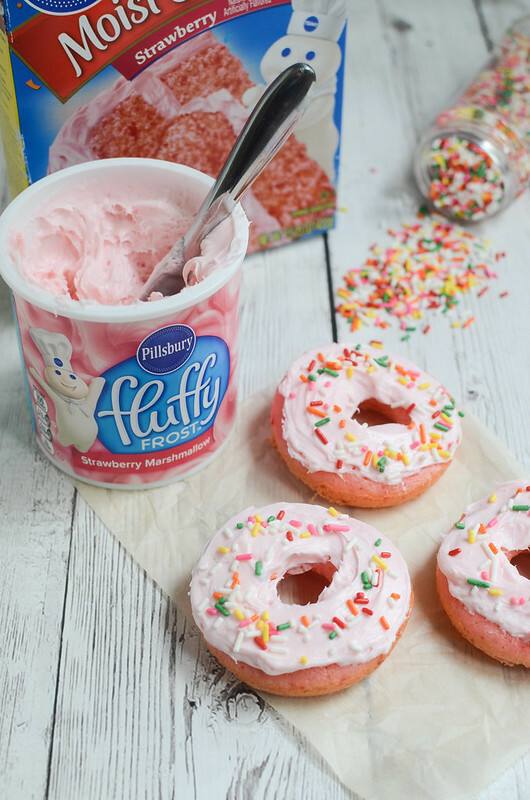 Once completely cool, spread Pillsbury Fluffy Frost in Strawberry Marshmallow on top of each doughnut.